Imagine a performance event somewhere between an academic lecture and cabaret. A mute corpse in an elaborately engineered whale boned costume peels off strips to reveal mysteries beneath the flesh. Narrated by her verbose double and accompanied by a musical saw-player, a whole fascinating world opens on how we perceive, and have perceived, our insides. This unique performance is drawing on the history of the Renaissance anatomy theatres of Europe. It plays with how, over the ages, human remains have been considered from a medical and moral point of view. When the anatomist’s knife first cut the body open in public, society was in turn opened up to new knowledge. The body’s interior parsed before the spectators eyes found echoes in the writings of Shakespeare and Johnson: the anatomy theatre and the soliloquy each being modes of introspection, both marking the birth of individualism. Playing with these ideas, THE ANATOMY ACT explores historical in contrast to current medical protocols: the merits of the virtual versus the corporeal cadaver in dissection training, haptics in knowing the body, and the vital contribution to knowledge provided by the human donor. 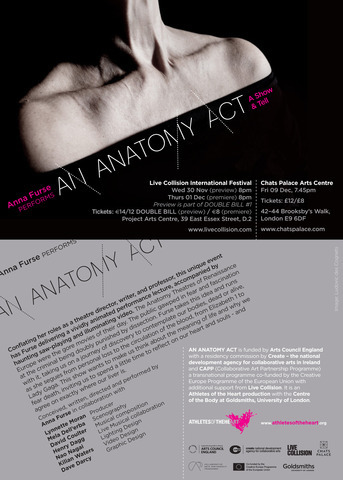 Weaving themes of life and death, the status of the cadaver, the way certain body parts become culturally meaningful, and what we know - or not - and disavow, this unique show takes the audience on a vivid journey of gazing and reflecting on our compulsion and revulsion at looking at ourselves inside and out. The production is a creative collaboration between director/writer/performer Anna Furse, musician David Coulter http://www.davidcoulter.co.uk/, and scenographer Mela Dell’ Erba of Teatro Garibaldi, Palermo https://teatrogaribaldiaperto.wordpress.com/. for Live Collision Festival, Dublin http://www.livecollision.com/.